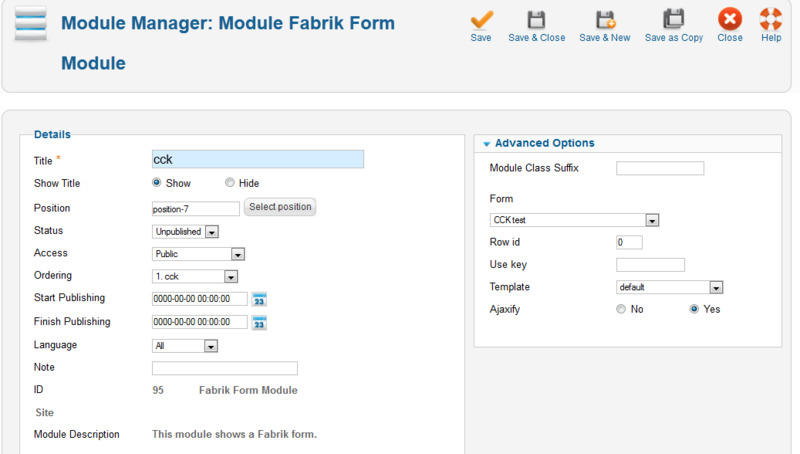 This module will insert a form into the selected module position. Row id - The row id to render -leave as zero to render a new form. Use -1 if you wish to insert the current user's id. Use -2 to insert the last recorded id. Use key - The field name to use to load the row. Leave blank to use the primary key. Set to a user field name and set rowid=-1 to load the user's record. Ajaxify - Should the form submit using Ajax - if yes will leave the user on the same page after submission.